At Breathing Space Bodywork, your session is always tailored to you and your current needs; no routines here. The bodywork modalities used during your session are determined during your session, not before. I can't possibly know what your body will need until you are on the table. I am trained in multiple modalities and am very intuitive and present; please trust me to listen to your body and chose the appropriate tools and techniques throughout the session. If it is your first time visiting, please aim to arrive 5-10 minutes before your appointment time to fill in some essential paperwork. Following a brief intake or check-in, you will receive the full session-time booked. A 60-minute session is actually 60 minutes of bodywork; the intake discussion is not a part of your session time. That being said, if you are late for your appointment, I will do my best to give you the full time booked but cannot guarantee that; particularly if there are appointments booked right after yours. All sessions address the full-body. I don't offer segmental treatments. You are a whole being and your entire body is important and deserving of quality, intentional touch. Treatments are available as 60-minute, 90-minute or 120 minute sessions. 60 minute sessions are intended mainly for relaxation and body-mind integration. To address specific areas of tension or pain, please book the appropriate 90 or 120 minute session. All treatments are provided by Tanya Bryant, Certified Bodywork Practitioner. 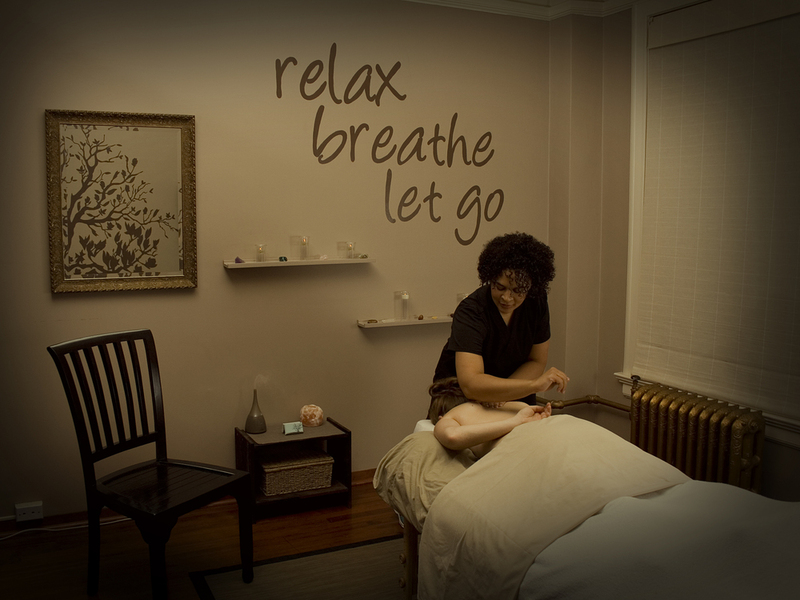 All treatments are provided by a Certified Bodywork Practitioner. There are no RMTs available. Aromatherapy is included in all treatments at no extra charge and I use only the highest quality essential oils from Floracopeia. A traditional relaxation massage designed to ease your body and mind. This 60-minute session includes aspects of Swedish Massage, Hydrotherapy, Shiatsu, Indian Head massage, Joint Release and Reflexology. A 90-minute session allows time for focus on specific areas of tension. Deep Tissue, Deep Flow, Hydrotherapy, Reflexology and Shiatsu techniques are incorporated to help take the receiver to the next level of relaxation and tension relief. This deep and luxurious 2-hour session is the best option for those looking to address multiple aches and pains. The session may include aspects of Shiatsu, Hawaiian Lomi Lomi, Deep Tissue, Reflexology, Joint Release, Hydrotherapy, Hot Stones, Indian Head Massage and Deep Flow, all choreographed into a unique treatment that will address deeper layers of tension and invoke absolute relaxation. The ultimate integrated bodywork treatment. Hot Stones, Reflexology, Indian Head Massage, oh my. Chest and abdomen are addressed with a special selection of essential oils. This is an excellent post-partum treatment option or for anyone wanting to experience a deeper connection with their front body... the more vulnerable side. Hot Stone treatment. The perfect rainy-day or wintertime choice. This 90-minute full body session melts away muscular tension. Using heated stones and medium pressure, relaxation is the focus. For deeper work, choose "Breathe" or "Let Go." Prenatal Massage. For the deserving mama-to-be. This full-body treatment addresses all of the areas that can be an extra pain during pregnancy; feet, legs and low back. A pregnancy pillow is used, allowing for maximum comfort and safety. Abdominal and breast massage are included but completely optional. Gift certificates are available for each service. If you would like to purchase a gift certificate for someone, there are 2 options: a hard-copy or an electronic version. If you would like a hard copy with a matching envelope, we can arrange a time for you to come in and pick it up. If you prefer to purchase online, you can use the PayPal link above or send an e-transfer to: tanyabryant@gmail.com and an electronic version of the gift certificate can be emailed to you or the recipient. If you pay online, and would like us to email the gift certificate to the recipient, please send an email with the recipient's name and email address and the giver's name. Gift certificates do not expire. If paying online via e-transfer, please be sure to add 5% GST to the prices listed above as they do not reflect the tax. PayPal will automatically add the tax at checkout.